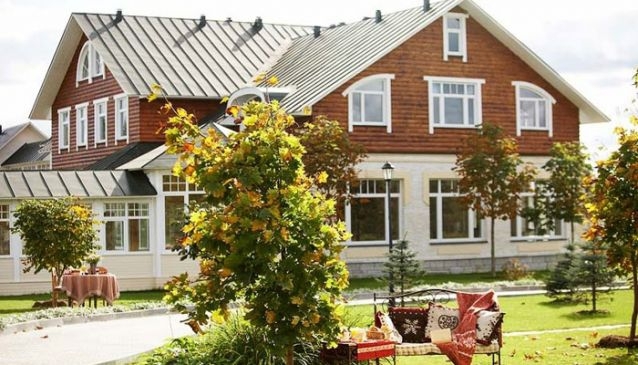 Potapovo invites you to enjoy atmosphere of cozy farm house and comfort of royal castle. Vast forests and fields are spread behind the hotel. Fresh air, quietness and pure sky - this is what any urban dwellers miss, admiring the stars and enjoying nature sounds and flavors. Two elite holiday houses, designed according to the best traditions of Alpine farms, are situated on 20 hectares of secured territories. You will spend unforgettable time with your family and friends in VIP houses: rich menu with farm-made meat and milk products; 5-star service and various activities. The hotel offers one-day excursion around the Farm, dinner, horse- or cabriolet-riding.